Jews and Arabs, under the auspices of the IsraAID NGO, are providing life-saving treatment and psychological support torefugees who survive the treacherous maritime journey to Lesbos from Syria and other strife-ridden Middle Eastern countries. LESBOS, Greece – A small speck appears on the horizon, sparking a furious exchange of WhatsApp messages. After checking his phone, Malek Abu Grara hops into a car, speeds down a narrow coastal road and screeches to a stop. A minute later he is standing on the roof of the car, peering out at the Aegean Sea toward Turkey, through a pair of binoculars. “They’re headed over there,” he shouts and is soon back at the wheel, hurtling toward a rocky stretch of coastline a few miles away. As he stops the car and scrambles down to the water, a small gray rubber dinghy overflowing with people can be seen bobbing among the waves. Within minutes the dazed faces of men, women and children holding what’s left of their lives in a bag come into focus. Another 40 or so refugees, packed into a boat meant for a dozen, are about to land on the shore of the Greek island of Lesbos. They have made it across the short but perilous 10 kilometers of sea – where other flimsy, overcrowded boats have capsized, killing hundreds this year alone– between the west coast of Turkey and this gateway to Europe. It’s a route that has been taken in the past six months by more than half-a-million refugees, mainly from Syria, Afghanistan and Iraq. 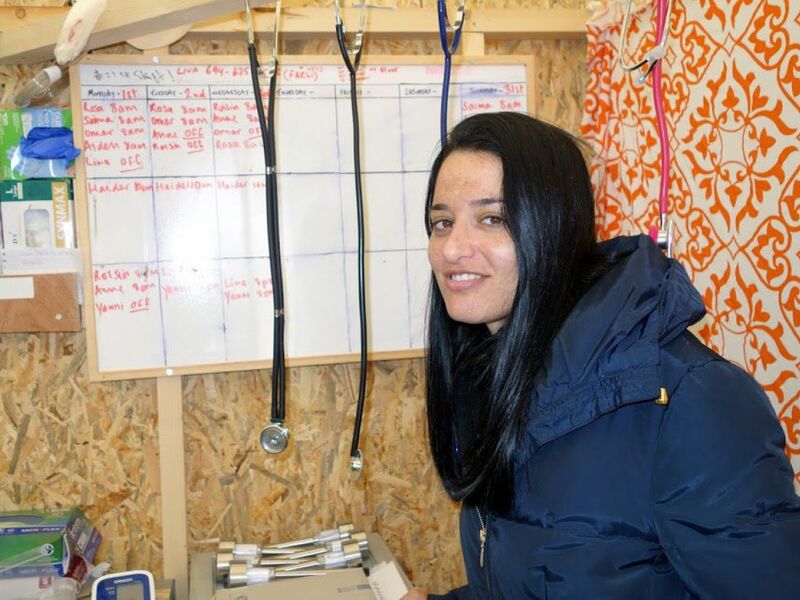 Abu Grara, a registered nurse from the Bedouin town of Rahat in the Negev desert, is on hand to provide medical aid to the refugees. He is one of about a dozen volunteers from Israel currently here under the auspices of IsraAID, an NGO that provides emergency aid and long-term support to victims of natural and man-made disasters worldwide. Since September, IsraAid has sent some 60 volunteers, both Arabs and Jews, to Lesbos, on rotation, to offer medical and psychological help to the refugees. In the trunk of the car Abu Grara, 22, has a mobile medical kit that includes defibrillators, ventilators, oxygen masks and assorted medications, as well as a pop-up tent – but this time he doesn’t need anything. These refugees, though damp and dazed, have arrived in pretty good shape. With his stethoscope dangling from his neck, he helps people out of the boat, offers them a blanket and utters reassuring words in Arabic. It doesn’t always unfold this way. Abu Grara recalls a sunny day in late October when a two-story wooden boat, full of refugees arriving from Turkey, was hauled to the coast of Lesbos after the top deck collapsed on the passengers below. 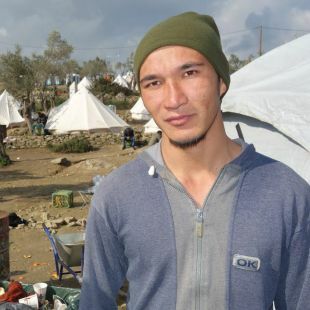 Abu Grara was one of dozens of volunteers who rushed to the site. 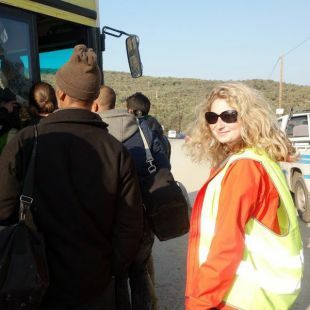 Naama Gorodischer, IsraAID’s global programs director, initiated the project on Lesbos in the wake of the chaos and desperation – of the refugees as well as the Greek authorities – that she encountered during a fact-finding tour here last year. At least half of the IsraAID team on the island at any one time are native Arabic speakers – Muslim or Christian Arabs who regard themselves as Palestinian, Israeli or both. Many of the Jewish Israeli volunteers also speak Arabic. One, Inbal Baron, speaks Arabic and Farsi, enabling her to communicate with most of the Afghan refugees as well. 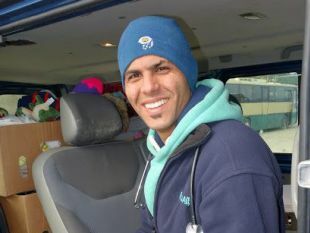 Molham Zreqe, a paramedic from Kafr Kana, near Nazareth, has also found that his language skills are often as vital as his medical training when it comes to aiding the refugees. The IsraAID volunteers have assisted in five births to date, usually on the beach. But that is hardly their main preoccupation. “The most common conditions you’ll encounter are panic, hypothermia, and stab wounds,” says Abu Grara, coaching two new medical volunteers who have just arrived from Tel Aviv and Modi’in. The stab wounds are usually incurred during the journey through Turkey, often as a result of altercations with smugglers who typically charge anything from $1,200 to $2,200 per person for a place on a boat, and sometimes force refugees at gunpoint to board rickety, overcrowded vessels. But many people arrive with wounds that cut deeper than any knife: They have been exposed to horrors back in their homeland and disaster on the voyage over. “I did art therapy with a boy from Iraq and he drew pictures of people cutting off the heads of others – that is what he had seen at home,” recounts Warda Alkrenawy, 35, who is also from Rahat and was the first Arabic-speaking social worker on the island. Others, she adds, have lost a child or a parent when their boat capsized. Alkrenawy herself has accompanied mothers when they went to identify and bury the bodies of children who drowned along the way. 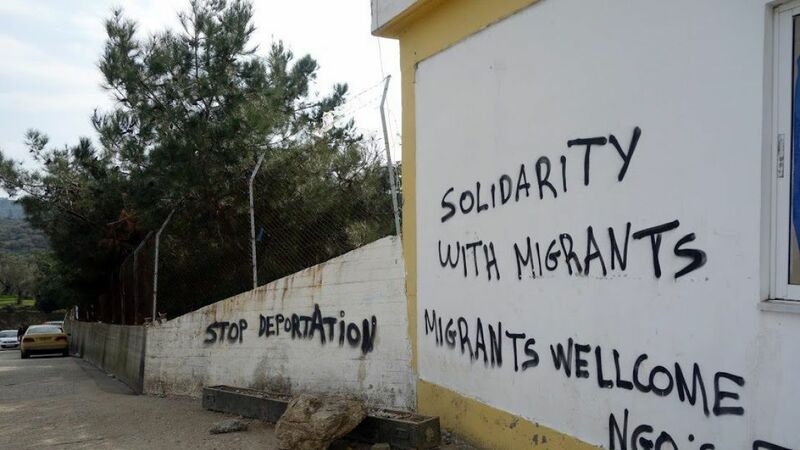 Most of the refugees remain on Lesbos for only a few days to register as asylum seekers. They then board a ferry to the Athens port of Piraeus and from there make their way toward their final destination – usually northern Europe, where they hope to start new lives. But those who are grieving are not among them, at least at first. At Moria, the main refugee camp on Lesbos, located near the capital Mytilini, refugees usually mill about for several days until they have completed registration procedures and secured a ticket for a ferry to the Greek mainland. A former army barracks, Moria is run by Greek authorities with the help of UNHCR, the United Nations’ refugee agency, and offers the basics: temporary shelter (in tents and pre-fab structures), food, showers, and basic medical care. Until the camp was set up a couple of months ago, thousands of refugees were sleeping on the streets, much to the astonishment and dismay of the island’s 85,000 Greek residents. The mayor issued an urgent plea for help and NGOs from several countries responded, setting up stations in the camp that distribute dry clothing and shoes, disseminate information, prepare meals and hot drinks, and provide first aid. Every refugee there has a story – usually, a heart-breaking one. IsraAID volunteer Talya Feldman recalls helping a 70-year-old couple from Iran at the camp. “Because they had lost all their money on the boat ride over they were unable to continue to Athens and were just sleeping at the camp in the cold and snow,” says Feldman, 23, an American Jew volunteering is Lesbos for three months. A research coordinator at Stanford University, Feldman helped arrange a ferry ticket for the couple. A Syrian man reveals that his 2-year-old son was killed when Russian forces bombed his home. After that several close friends and relatives lost their lives when the field on which they were playing soccer was bombed – he isn’t sure by whom. And then there are those people who, when asked why they left home, answer with a single word and gesture. “Daesh,” they exclaim, using the Arabic name for the Islamic State and the gesture of a throat being slashed. Asked what they hope to find in Europe, the most commonly heard refrain is “freedom.” It’s one of the few words many can say in English. But the journey to freedom has a price – one which hundreds have paid with their lives. On a deserted beach on Lesbos lie a pile of discarded orange life jackets, detritus of the last boatload of refugees. Zreqe holds up one of the life jackets and demonstrates how, when a rescuer pulls on the strap to lift a person out of the water, it rips in a second. 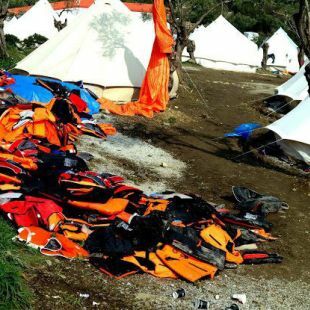 “The smugglers on the Turkish side fool the refugees, telling them that they are safe with these life jackets, but they are just cheap imitations of life jackets – some of them don’t even float,” the paramedic says angrily. “So many have drowned because of these,” he adds, throwing one of them aside in disgust. The volunteers can help refugees only once they have arrived on the Greek shore. If a boat capsizes, it’s up to the Greek coast guard to reach the passengers. Some volunteers who have ventured out deep into the water to assist in such cases have been arrested by Greek authorities and charged with assisting in human trafficking. Thus, boats can be forced to spend hours at sea with passengers suffering from hypothermia – or worse. Sometimes as the vessels approach, Abu Grara hears the screams and cries of the passengers. He knows he can’t do anything for them until they reach the shore, and even then, for some, it may be too late.